Fashion Asia: Shopping for Korean stuffs in KL?? 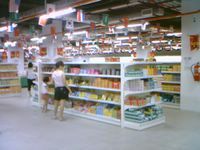 Shopping for Korean stuffs in KL?? Yeah!! How cool is that? See, me and the fiance chanced upon this place when one saturday. I wanted to pay bills in citibank so we thought of going to KLCC afterwards for dinner. However, the fiance thought to be adventurous and drove along jln ampang aimlessly after citibank to find a place for a fine dine. Anyhow, the entire complex is very empty and no fun to shop at all. But I found this little Korean Hypermarket to be facinating. The moment i stepped into the place i feel like a little girl entering Toys-R-Us. I dashed to the counter and get myself a basket and throng my way down the isles of korean food. Yummy....everything looks so delicous. I grabbed some of the items which i fancy, double check the prices and throw them in my basket. Frankly speaking i was expecting the price tags to be rocket high since everything is imported, but it really isnt. Pretty much like the price of the stuffs you normally buy from Watsons. So i guess its quite reasonable. The hard part is to identify the item contents. This is cos everything is in Korean!!! I'd just have to make do with some guesses and just "gasak" whatever my eyes fancy. hehe. Bought some cute cute bubblegums too. The whole time i was there, i felt like i was in Korea. We even had Korean food there. Eventhough the place was not really that impressive(abit like self-service cafeteria layout), don't be fooled.The food surely taste good. And best part is its made by genuine Korean middle-aged lady and not some locally hired staff. Highly recommended if you ask me. Very yummy indeed. You can get your free plain water from the water dispenser too. On a side-note,I was really dissappointed with the Tepanyaki Japanese Restaurant. I brought my parents to the newly opened Sri Hartamas complex and we ordered some food there. The food was cooked by 2 malay chaps and it totally taste like local malay cooking. No japanese flavour at all. Even the rice is local rice and not the japanese pearl rice. Very dissappointing indeed. My sisters-in-law (my hubby 4 big sisters) often wear Korean blouses. You know? Those very Ah Sohs type. So, I have the impression that Koreans clothings are likedat. Hahaha, did not know that Koreans stuffs are not like that. Nice preview. wow... does anyone have any ideas where this is? I would really like to drop in. there's another shop selling korean stuff in Hartamas. it's just next to Uncle Don's. Ooh I didn't know about this! I will have to try and find it next time I visit KL, I love Korean food! There are quite a few Korean shops in Ampang. It is a mini Korean town anyway... And coz the Koreans are so into CUTE stuff, you'll find that most of the things they sell are 'cute'. By the way, there's also a shop that i saw in Bukit Bintang that sells Korean stuff... It's right across from BB Plaza's main entrance. 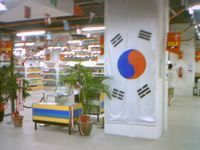 *If you go shop in a Korean store, U can try the Korean greeting. 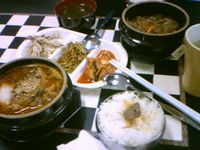 I just happen to do a search on korean restaurant, and it landed to your website. Do you love authentic korean kimchi ? Let me share with you a korean kimchi that I used to get it from (It was introduced by my korean friend). It is very nice and cheap too. It tasted much much better than other Korean shop that I usually gets. just want to know, is it halal or pork and alcohol free?